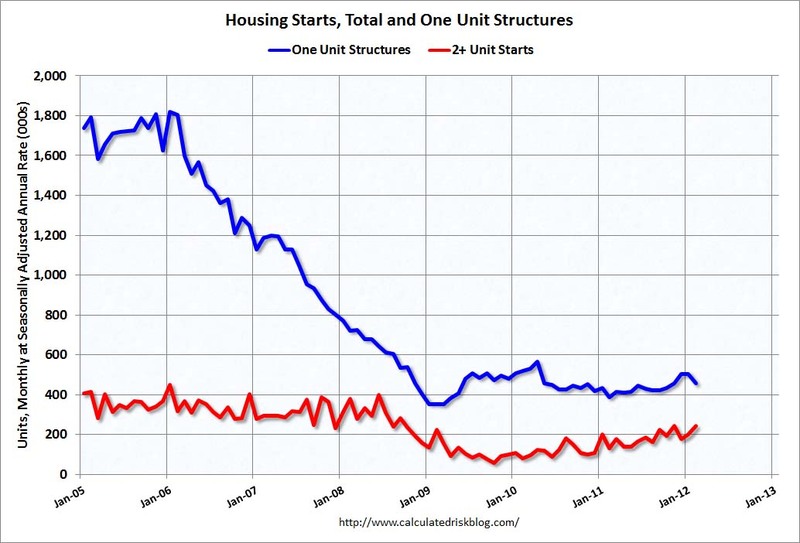 Privately-owned housing starts in February were at a seasonally adjusted annual rate of 698,000. This is 1.1 percent (±15.9%)* below the revised January estimate of 706,000 (revised up from 699,000), but is 34.7 percent(±16.7%) above the February 2011 rate of 518,000. 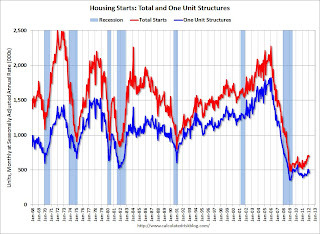 Single-family housing starts in February were at a rate of 457,000; this is 9.9 percent (±11.4%)* below the revised January figure of 507,000. The February rate for units in buildings with five units or more was 233,000. Privately-owned housing units authorized by building permits in February were at a seasonally adjusted annual rate of 717,000. This is 5.1 percent (±1.2%) above the revised January rate of 682,000 and is 34.3 percent (±3.1%) above the February 2011 estimate of 534,000. Single-family authorizations in February were at a rate of 472,000; this is 4.9 percent (±1.2%) above the revised January figure of 450,000. Authorizations of units in buildings with five units or more were at a rate of 219,000 in February. Total housing starts were at 698 thousand (SAAR) in February, down 1.1% from the revised January rate of 706 thousand (SAAR). Note that January was revised up from 699 thousand. Single-family starts declined 9.9% to 457 thousand in February. 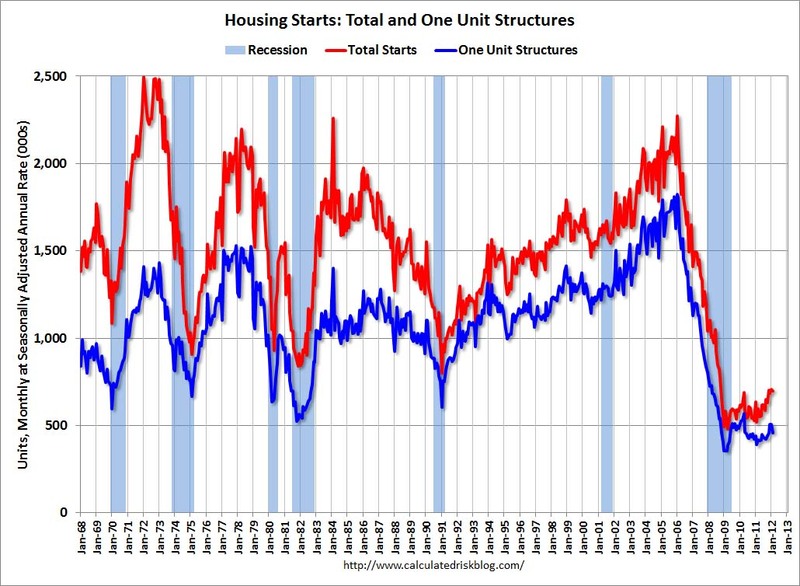 Permits moved higher, so single family starts will probably increase in March. 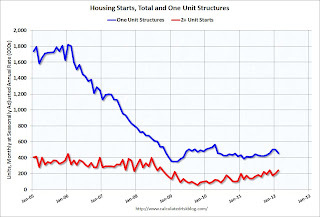 This shows the huge collapse following the housing bubble, and that total housing starts have been increasing lately after sideways for about two years and a half years. Total starts are up 34.7% from a year ago. This was slightly below expectations of 700 thousand starts in February.